Negotiating Transcultural Relations in the Early Modern Mediterranean is a study of transcultural relations between Ottoman Muslims, Christian subjects of the Venetian Republic, and other social groups in the sixteenth and seventeenth centuries. Focusing principally on Ottoman Muslims who came to Venice and its outlying territories, and using sources in Italian, Turkish and Spanish, this study examines the different types of power relations and the social geographies that framed the encounters of Muslim travelers. 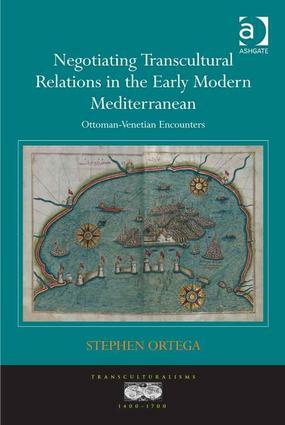 While Stephen Ortega does not dismiss the idea that Venetians and Ottoman Muslims represented two distinct communities, he does argue that Christian and Muslim exchange in the pre-modern period involved integrated cultural, economic, political and social practices. Ortega's investigation brings to light how merchants, trade brokers, diplomats, informants, converts, wayward souls and government officials from different communities engaged in similar practices and used comparable negotiation tactics in matters ranging from trade disputes, to the rights of male family members, to guarantees of protection. In relying on sources from archives in Venice, Istanbul and Simancas, the book demonstrates the importance of viewing Mediterranean history from a variety of perspectives, and it emphasizes the importance of understanding cross-cultural history as a negotiation between different social, cultural and institutional actors. Contents: Introduction; Scattered about the city: Ottoman networks and attempts to control them; Negotiating with the Venetian bureaucracy: paths of integration; Moving across boundaries; Projecting Ottoman power; A Mediterranean conflict: alliances, factions and networks; Epilogue; Bibliography; Index. Stephen Ortega is Associate Professor at Simmons College. He teaches cross-cultural, Islamic and world history.